Justin Bieber’s rise from "regular kid" to one of the most famous people on the planet has captivated a nation of devoted fans called “Beliebers.” With hit records, 8 million followers on Twitter and the third-largest grossing documentary film of all time, the 17-year-old Canadian pop star dubbed “Super Boy” on Rolling Stone’s recent cover has countless fans who hang on his every word. But is there more to this pop idol’s startling success than his legendary haircut and unusual talent? “The success I’ve achieved comes ... from God,” Bieber says "I feel I have an obligation to plant little seeds with my fans. I'm not going to tell them, 'You need Jesus,' but I will say at the end of my show, 'God loves you. 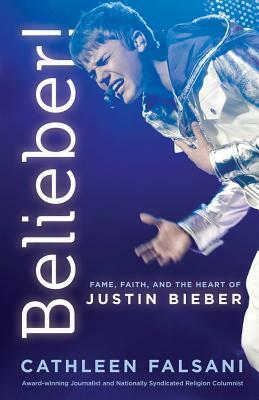 '” The bold yet humble faith that grounds Bieber's worldview may just be the key to his extraordinary appeal. Recognizing that music and film are the language of this new generation, author and religion journalist Cathleen Falsani's hope is that this book will encourage faith leaders as well as parents to engage with popular culture in a different way so they can better talk to their kids about what matters most. Cathleen Falsani is an award-winning religion journalist and author who specializes in the intersection of spirituality and popular culture. Currently a columnist for Religion News Service in Washington, D.C., Cathleen is best known for her personal interview profiles of Barack Obama, Bono of U2, Elie Wiesel, Hugh Hefner, Anne Rice, Dusty Baker, Melissa Etheridge, Studs Terkel, Michael Gerson, Annie Lennox and many other notables. She is the author of three critically acclaimed books The God Factor, Sin Boldly and The Dude Abides: The Gospel According to the Coen Brothers. Religion writer for the Chicago Sun-Times from 2000-2010, Cathleen now lives in Laguna Beach, California, with her husband, fellow author and Pulitzer Prize-winning journalist Maurice Possley, and their son, Vasco.